CryptoSlots.com from Slotland, is a recently launched online casino which only accepts cryptocurrency. The new casino features a million-dollar jackpot game and 21 unique slots and video poker games. CryptoSlots currently supports Bitcoin, Bitcoin Cash and Litecoin transactions and will be adding additional cryptocurrencies soon. CryptoSlots comes to us from Slotland, one of the most experienced, trusted and innovative names in the online casino business. "In our other casinos, we've seen a huge increase in players opting to play in cryptocurrencies to avoid banking delays and complications," said Slotland's Michael Hilary. "CryptoSlots is designed to make it easy for players to play in crypto, but still bet in USD. Crypto also allows for increased player anonymity since all that's required is an email address and crypto wallet." CryptoSlots is launching with 21 unique games (slots, video poker and the exclusive Jackpot Trigger) and will be quickly adding many more new games from Slotland.eu and WinADayCasino.eu. If you are looking to win big, five of these games are high limit variations, unique to CryptoSlots. 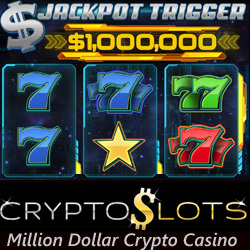 The $1,000,000 Jackpot Trigger, exclusive to CryptoSlots, is a real stand-out. Played with tokens collected while playing other CryptoSlots games, you can win up to $1,000,000 in a single spin. In keeping with CryptoSlots' commitment to transparency, all games are Provably Fair (https://www.cryptoslots.com/en/provably-fair). Provably Fair is a modern technology that allows players to test the randomness of all game results. The result of any spin or shuffle of any card deck can be proven fair at CryptoSlots, including the Jackpot Trigger game. Your cryptocurrency deposits are automatically converted to USD for play. Sign-up is quick and easy, requiring only an email address. All games can be played on any computer, smartphone or tablet. Bitcoin, Litecoin and especially Bitcoin Cash withdrawals can be processed very quickly. Weekly cashback bonuses will give players a second chance at winning by returning a portion of their net losses. Regular newsletters will give members extra rewards on special occasions. Plus the more players win, the more Jackpot Trigger tokens they collect and the higher their chances are of winning the million dollar jackpot.